This is F’s chili recipe. Though I find that chili hardly needs a recipe — there are so many variations of it that it’s really up to you to personalize it. So think of the following recipe as a base to riff on. Aside from the fresh peppers — a bit pricey in the wintertime — this is an extremely frugal dish, mostly consisting of canned beans and tomato products. 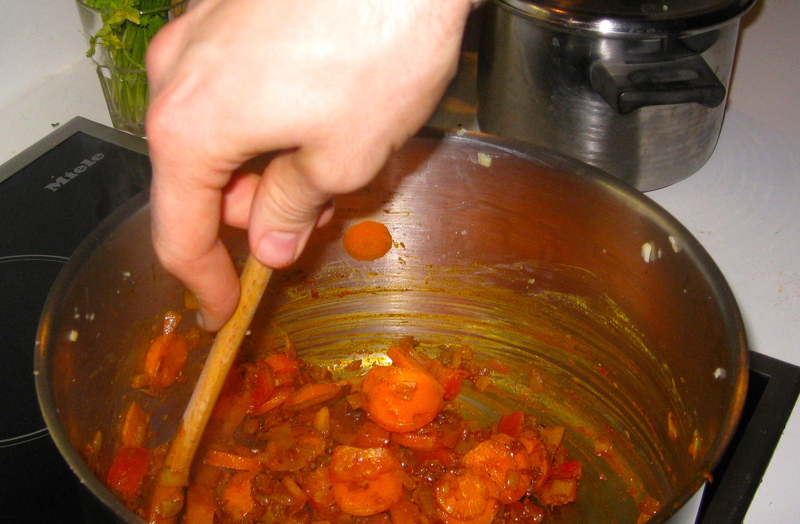 It comes together quickly, though the longer it simmers the better it’ll taste. (Note: if you’re using any dried beans, soak and cook them before adding them to the chili. We didn’t pre-cook the black beans so they were still a bit crunchy when we ate.) Serve the chili with cornbread or over rice, and top it with whatever you like. We prefer gherkins, sour cream, cheese, and avocado. Again, the following recipe and its ingredient ratios are just what we happened to use this time. (We were going to add sweet potatoes but didn’t have any.) Next time it’ll probably be totally different. We made a monstrous amount so we can freeze some to enjoy at a later date. Happy experimenting! Cook the onions and garlic in oil on med-high heat until they become slightly brown and translucent. Add the peppers and sauté for a few more minutes, until the peppers start to become soft. 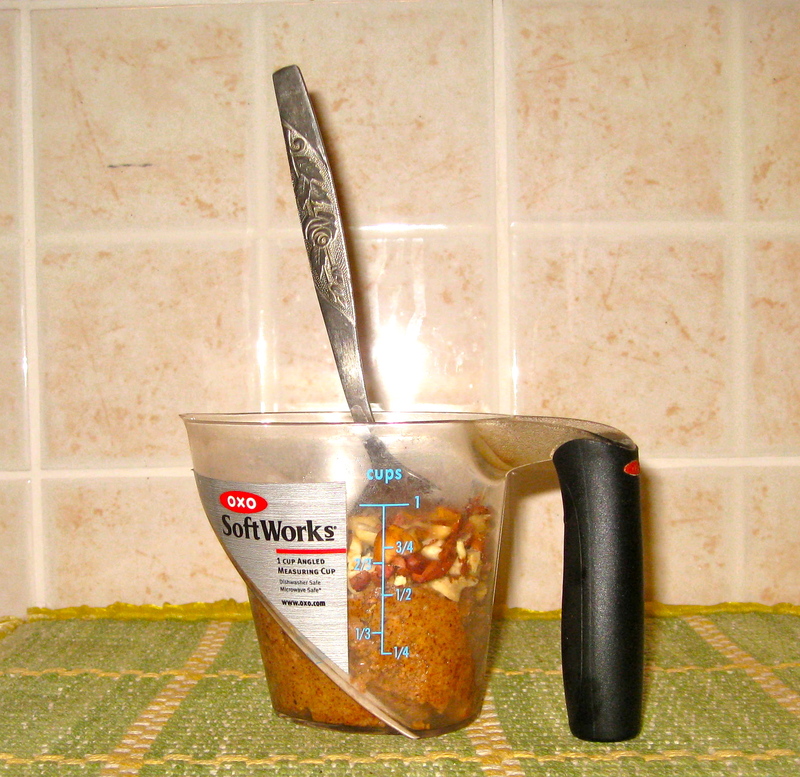 Pour in all the canned stuff and the spices. Add enough water so that everything is covered. Throw in the sweet potato cubes, if using. 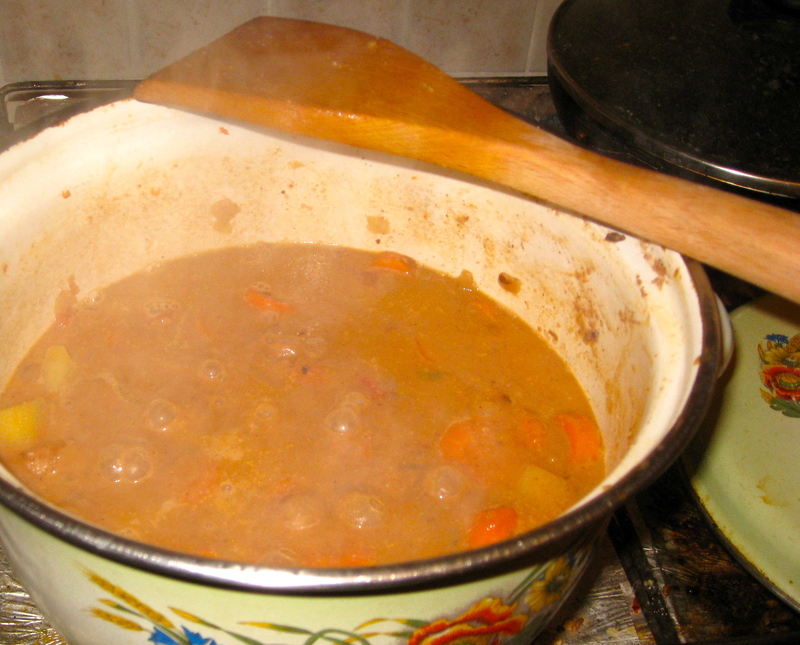 Bring to a boil and let simmer with the lid on or cracked, for 45-60′ or until the beans taste cooked. Serve over rice or alongside cornbread and topped with your preferred combination of gherkins, cheese, sour cream, and/or avocado. 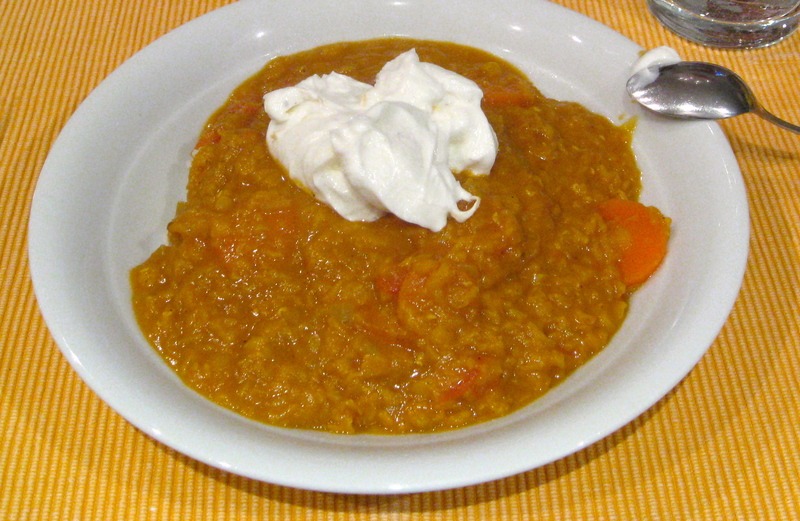 This entry was posted in food, full meals, health, pictures, recipes and tagged stew, sweet potatoes on 14.02.2013 by taplatt. I grew up enjoying my mom’s delicious beef stew almost every winter — my dad always made buttermilk biscuits to go with it. It’s the ultimate winter dish, full of richness, warmth and comfort. F added beef to a soup we ate the other week, and it made me think of my mom’s beef stew. So I asked her for the recipe, which she said originally comes from the old Betty Crocker cookbook that my parents have. 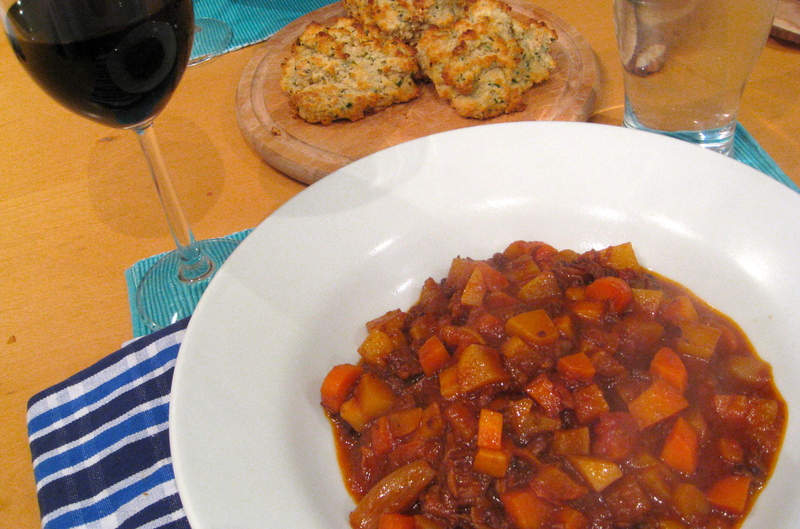 She and my dad have doctored the stew recipe over the years to achieve ultimate deliciousness. F and I further developed it; we had to add more liquid (and chose to do so with more wine rather than water) and we tossed in a few extra root vegetables. It turned out so well and so rich that I could not finish what was in my bowl. I made these biscuits (with chives instead of scallions and with buttermilk instead of regular milk) to soak up the juices. Second- and third-day stew almost tasted better than it was the first night. Note: this stew takes quite some time to cook — start the process 3-4 hours before you plan on eating (you’ll have plenty of down time while it’s simmering). This is one of the best dishes ever. Brown the stew beef in a large pot. 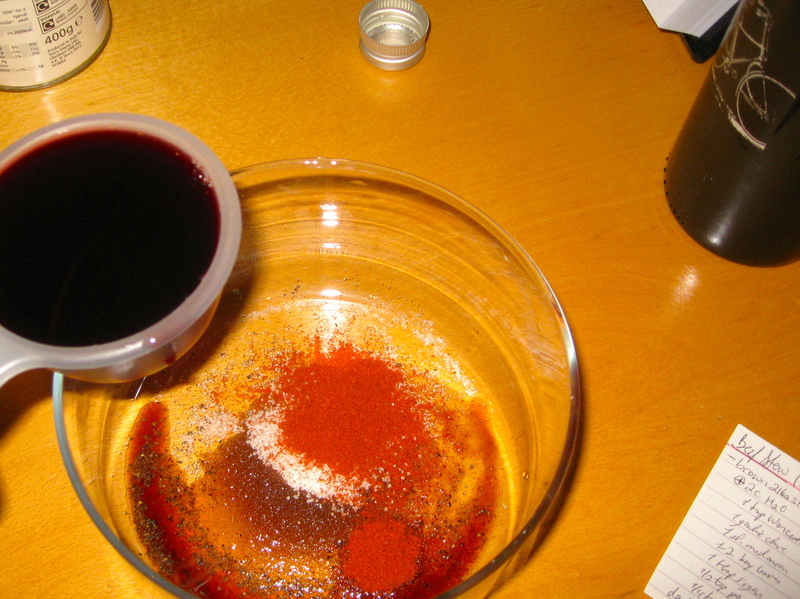 Add the spices and liquids (through red wine, above). Bring to a boil, then cover and simmer for 1.5 hours. Add the chopped the root vegetables and peeled shallots. Cover and cook for another 30-45 minutes, or until the vegetables are cooked through. Serve with a warm buttermilk biscuit. This entry was posted in culture, family, food, full meals, health, pictures, recipes and tagged stew on 22.01.2013 by taplatt.